For a complete list of 805 Living advertisers, click here. 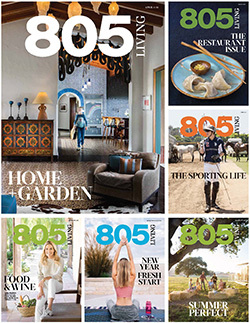 An estimated 210,000* readers turn to 805 Living for the inside scoop on living the good life in western Los Angeles, Ventura, Santa Barbara and San Luis Obispo counties. 805 Living readers are powerful consumers. They are uniquely positioned with the desire and the means to enhance their lives. 805 Living — an audience worth investing in. audited circulation of 32,000 copies. for credibility and accountability of our circulation numbers.